Eliminate wear and tear on your carpet while enhancing the vintage look of your interior with these attractive "Custom Vintage" rubber style vinyl floor mats from Legendary Auto Interiors®. Classic Industries® now offers the latest d esigns in custom logo floor mats. 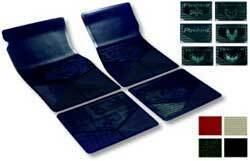 These die-cut mats are designed to fit the floor pan of each year offered. Each mat features custom logos embossed on the front and rear mats (unlike other reproductions that only include logos on the front mats). Patented Sure-Grip™ Anti-Skid backing keeps the mats where they belong and eliminates unnecessary movement. Manufactured in 100% vinyl construction offering a mat that's easy-to-clean with soap and water.